We welcome all athletes who put fun fitness first! SFRW produces a diversified schedule of Racewalk & Running events that encourage non-athletes and athletes to participate or compete locally, regionally, nationally, and internationally. SFRW provides competitive opportunities to enhance the skills of youth, senior, and master racewalkers and runners. 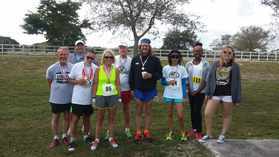 SFRW is a member club of USA Track & Field Florida (Club #14-1053), and National USA Track & Field, Runners Club of America (RRCA). Through its members and events, SFRW educates the public about Racewalking and the benefits of walking and running for fitness and health. We cooperate with local organizations and running & walking clubs and provide information about Racewalking and healthy living. A portion of many of our events benefit local worthy organizations such as Special Olympics and the Organ Transplant fund. We welcome all athletes wishing to perfect their technique to meet us at Plantation Central Park Tuesdays and Thursdays from 6 to 7:30 pm. There will be no cost for the practice. Do you have stories or pictures to share from past races? Please send them in, and we will be happy to post them on our site! Our club joins the rest of the racewalk community in mourning the loss of José Alberto Alegría, our former SFRW Vice-President. He will forever remain in our hearts. Special thanks to Gary Null ( https://www.garysvitamincloset.com ) for supporting our club.